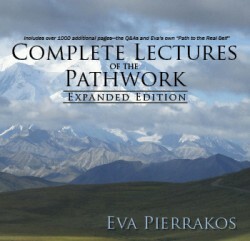 There are many additional Pathwork® materials available in print and electronic format such as the Pathwork Book Series, the Original Audio Series, a Professionally read series of lectures called the Provoice Audio Series, the Pathwork CD (pictured here), a music CD called Be Still and Know and more. There are also some unpublished materials such as private sessions with Eva and the Guide which are kept archived in a climate controlled warehouse in New Jersey, USA. You can purchase any of the published Pathwork materials in our e-store, on Amazon’s Kindle, Smashwords, or through your local bookstore. 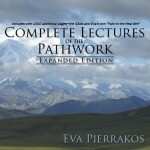 Complete Lectures of the Pathwork—Expanded Edition contains over 6500 pages of content including the The Unedited Lectures, an historical edition of the lectures, a set of Guide Messages called The Additional Materials; a body of material (over 1000 pages) called The Q&A’s; and Eva’s own book titled The Path to the Real Self . To view the Unedited Lectures and access them as individual downloads please purchase a yearly subscription. Your subscription will entitle you to unlimited access to these lectures. Additional material, including the PTH (Pathwork Teachers Helper), will be added soon for all subscribers.